The northern giraffe (Giraffa camelopardalis), also known as three-horned giraffe, is a species of giraffe native to North Africa. 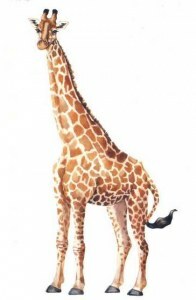 It is considered the type species and one of the four living species of the genus Giraffa. The species was described and given its binomial name by Swedish zoologist Carl Linnaeus in 1758. Three subspecies are recognized. Northern giraffes can interbreed with other giraffe species in captivity or if they come into contact with populations of other species in the wild.